Don’t expect house prices to just keep on going up. House prices are probably the last thing you want to talk about if you’re underwater on your mortgage. On the other hand, if you live in San Francisco, London, Berlin, Paris, Hong Kong, Singapore, Sydney, etc. you might be thinking how high can house prices go? This video has been rattling around in my head for the last 18 months – after a conversation with a very smart man about London house prices. And his outlook has proved right – London house prices rose 13.8% last year. But can it continue? 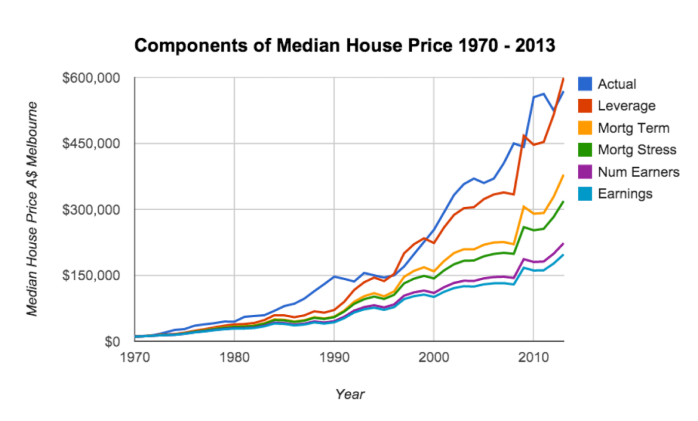 Australian house prices and the housing market in general is not that dissimilar from the rest of the developed world. And the conclusions drawn apply equally to most capital city housing markets around the world. Yes, there are regional subtleties, but the role lending criteria and LVRs play is totally underestimated in this whole property “bubble” discussion. And don’t forget, virtuous feedback loops or virtuous circles can just as easily reverse and become vicious. Two recent articles showing the difference in attitude towards leverage between Chinese property buyers in Australia and local Australians. Chinese buyers typically put 50% down and then apply for a mortgage for the remaining 50%. This article describes the experience of Yellow Brick Road, a mortgage lender part-owned by Macquarie Bank, that offers Australian mortgages to Chinese overseas buyers. These aren’t Chinese billionaires moving money offshore – they’re successful Chinese business people who want to put their children through university in Australia and are typically buying student apartment accommodation. On the other hand, the big 4 banks in Australia now all offer zero-money down mortgages. This article explains that the mortgages have to be guaranteed by a family member. And likely those family members are feeling pretty flush because their house keeps on going up in value – as a result of this crazy bank-led Ponzi scheme. Steve H. pointed out that I hadn’t mentioned the role of foreign cash buyers at the high end of the market. This has definitely impacted prestige suburbs in London, Paris, Berlin, Munich, Hong Kong, Singapore, Sydney, etc. “Fascinating piece – thanks for sharing your thoughts. I don’t disagree with anything you said, but I do think you overlooked a key factor which in the markets you highlighted might be (almost?) as important as rising LVRs: incoming waves of relatively footloose foreign money, quite a lot of which probably doesn’t rely all that heavily on mortgage finance. In the US, Carol D. pointed out she was also seeing cash buyers in her home market, Austin. And John B. confirmed the German property market boom. “The rush into Munich real estate has been going on for several years. Munich and Stuttgart are probably even worse than Berlin, in that sense, Munich is most expensive in terms of price per square meter. Last year, there were some reports on TV about real estate buyers from UK and France who were looking at Berlin properties because prices there were still low compared to London or Paris. For example they interviewed a French executive who found his budget only allowed him to buy a small one bedroom flat in Paris. He opted instead for a generous, brand new 3 bedroom flat in Berlin, as a rental investment, more than twice the size, and better ROI. “The US (and almost all developed countries) experienced the greatest real estate boom in modern history, initially as a result of being home to the first middle-class generation that could broadly afford homes after World War II, and then as a result of the massive Baby Boom generation, which now clearly has peaked and is being followed by a smaller generation. The result was to create a temporary illusion that real estate only goes up and it outperforms economic growth. The great real estate boom from 1933 to 2005 will not be seen again anytime soon – and perhaps never – in the developed countries.